digital maturity - Eric D. Brown, D.Sc. Digital Maturity or Digital Transformation? Everyone’s working on digital transformation projects. Much like ‘big data’ or ‘machine learning’, digital transformation is a phrase that you hear every day across just about every organization. The problem with digital transformation is that its not the end goal….you don’t set a goal of ‘being transformed’ especially when you’re looking at the digital space. Rather, you set goals around engagement, conversion and revenue that are better / higher than what you have today. You shouldn’t be focused on ‘transforming’ your business but on maturing your business into one that can operate in the digital model for the long run. This requires much more than digital transformation; it requires digital maturity. Digital maturity is the process of your company learning how to respond appropriately to the emerging digital competitive environment. Part of any good digital transformation initiative should include aspects that help an organization and its people internalize knowledge about the digital landscape, but most times it stops short of converting information about the digital world into knowledge (and ultimately into wisdom). According to the DIKW Pyramid, there are three steps required to turn data into wisdom: data -> information -> knowledge -> wisdom. Digital Transformation often stops short of creating ‘digital wisdom’ which is what’s necessary for digital maturity to occur. Without wisdom, you’re organization hasn’t quite reached the level of digital maturity needed. 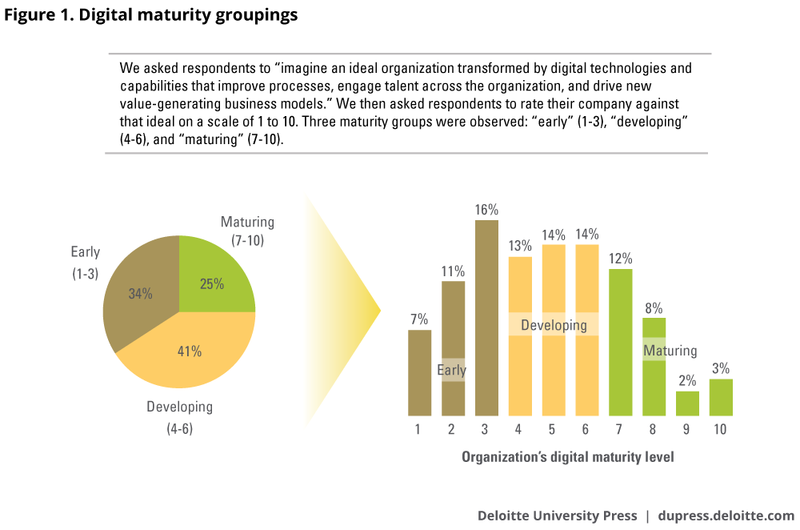 With digital maturity, rather than chase new digital projects an organization just is digital. This doesn’t necessarily mean the organization will have all the answers to all things digital, but it does mean that the people within the organization will have the skills and the tools to find those answers quickly and act upon the digital needs of the organization rather than just talk about the digital needs. 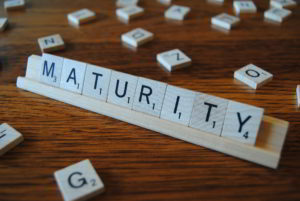 Deloitte released a study recently based on three years of research into digital maturity. 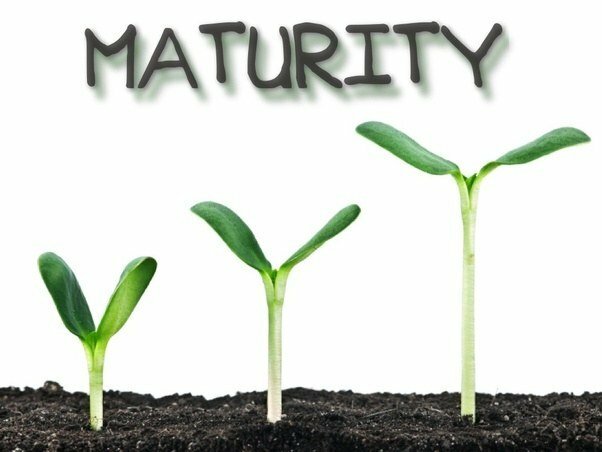 In that study, they asked respondents to rate their digital maturity levels from a scale of 1 to 10 with a rating of 1 to 3 being ‘early maturity’, 4 to 6 being ‘developing maturity’ and 7 to 10 being ‘mature’. In the survey, only 25% of respondents rate their organization in the ‘mature’ category. You can see the outcome of the survey in the image below. 34% of respondents from organizations at early stages of digital maturity say that their company spends more time talking about digital business than acting on it. Digitally maturing organizations also take a longer view on digital strategy: They are twice as likely as early-stage companies to develop these strategies with time horizons of five years or more. There’s some interesting results there there. Digitally mature organizations are planning for the ‘long game’ rather than (or maybe in addition to) running around trying to figure out how to get a customer in the door next week. Additionally, these companies with digital maturity are using technology to do things differently than they have done things before. Digital transformation shouldn’t be the end goal for organizations. You don’t want to just transform into a ‘digital’ company doing things the same way you always have. You want to fundamentally do things differently using technology. That’s what digital maturity is. This might require new organizational constructs (cross-functional teams, etc), a rethinking of digital platforms (do you really need 50 different martech platforms?) and/or chasing different projects/initiatives. Reaching digital maturity means going through growing pains, but in the end it should be worth the pain to be able to ‘live digitally’ as an organization. Don’t just settle for digital transformation for transformation sake. Set the main objective of your digital transformation projects to be digital maturity. Join the Deloitte respondents taking the long view and using technology to change the way you do business.